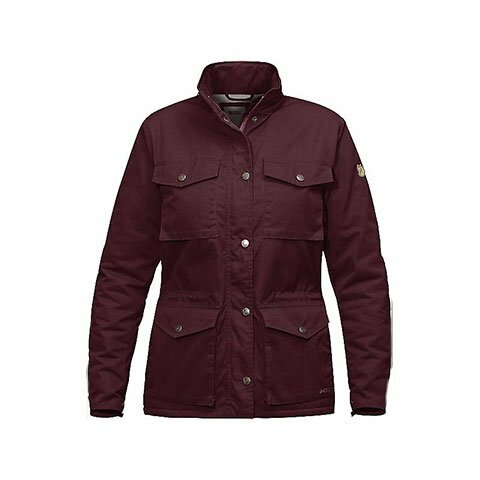 Hardwearing, padded outdoor jacket in G-1000 Eco in recycled polyester and organic cotton with a soft teddy-fleece lining for comfortable warmth on cold days. An autumn/winter version of a classic Fjällräven model from the end of the 1970s that is just as practical for everyday use as it is in the wilderness. It has a comfortable, simple hood in polyamide/organic cotton that can be rolled into the collar when not in use. The chest pockets have room for items needed close at hand, and there are large top-loaded bellows pockets lower down with extra openings at the sides. The front zipper is two-way and is covered by a protective flap with press buttons. Bellows pleats at the shoulders and extra pleats at the elbows give excellent freedom of movement, while drawcords at the waist and hem give a good fit. Press buttons can be used to adjust sleeve cuffs. The jacket can be waxed with Greenland Wax for extra protection against the elements, and this also increases durability and longevity on an already long-lived garment.